On the the Kennerspiel des Jahres, a new award this year to be given to the best complex game of the year. I’ll be taking a look at two of the three nominees here. The one I’m skipping is 7 Wonders. For one thing, I already covered it (in my very first post on this blog). For another, though I have played the game once, I don’t feel like I’m qualified to give a review. I need to play it a couple more times first. However, it is a very good game that I want in my collection, if that’s a good enough review for you. On to the next nominee! 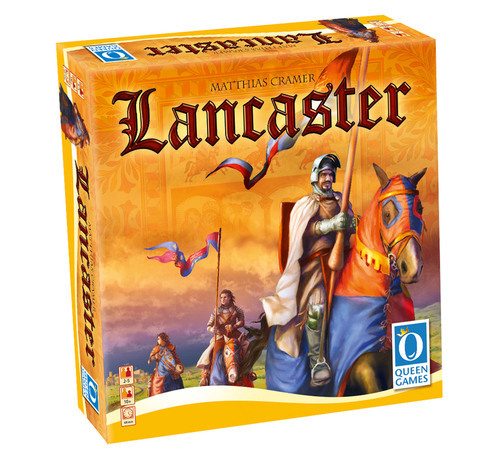 Lancaster was designed by Matthias Cramer and was brought to you by Queen Games. It’s for 2-5 players aged 10 and up, and takes an hour to play. The game is set in medieval times, and involves various lords trying to position themselves as the most powerful ally of the King. There are elements of area control, worker placement, and politics as you try to advance your own agenda. Cramer’s previous game, Glen More, got a lot of positive press, and this one landed a KSDJ nomination, so let’s take a look. 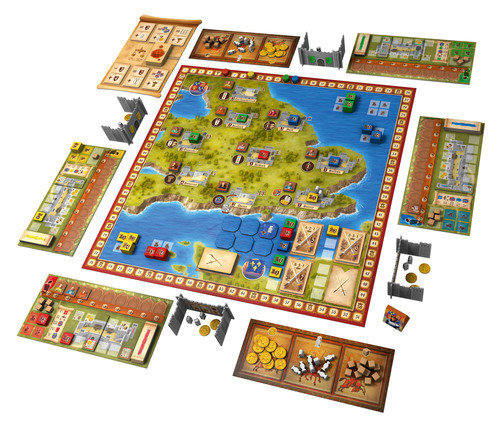 The game comes with a board, two supply boards, 37 squires (wooden people), 37 gold pieces, 37 voting cubes, a start player marker, 12 conflict cards, 6 king’s favor tiles, 1 parliament board, 18 law cards, 5 player markers, 35 knights (wooden pieces of varying heights with stickers to affix), 5 castle boards, 30 extension tiles, 5 screens, 10 voting tiles (yes and no), and 4 ally boards for the 2-player game. Players begin the game with a castle board, six extension tiles, a screen, two knights (strength 1 and 2), a voting marker, two gold, two squires, and two voting tiles. Gold and squires are always hidden behind your screen. County – These are spaces on the map. Each county has a number (1-4), and your knight must match or exceed that number when placing. When placing in a county, you may add as many squires as you want. Each squire adds 1 to your strength, but don’t count towards matching or exceeding the knight number. You can expel a knight from a county by having your combined strength beating their combined strength (knight plus squires). The expelled knight is available to be placed again during this turn. Castle – Castle spaces are on your castle board. All you do is place a knight in an available space. Conflict – The conflict spaces are in the lower right corner of the board. There’s a conflict card in some of the spaces, and represents war between England and France. You’ll place in one of the available spaces – there are three for each conflict card. You can only use one space per conflict card, but you can stack your knights on top of each other to reinforce your strength. The first six knights to take this action get an immediate reward in the form of one of the king’s favor tiles. With these you can upgrade a knight, gain gold, gain squires, or take a nobleman. During the Parliament phase, the players vote on three new laws. At the start of the game, there are three laws displayed on the parliament board, and three laws to be voted on. These laws give certain benefits to people who fulfill certain conditions. You vote on each law secretly by using your voting tiles, and you can also add voting cubes to reinforce your vote. Add up the votes, and majority wins (with ties meaning that the measure is approved). Used cubes are returned to the supply. If the law passes, you’ll replace the first law in the current set. If the vote fails, the rejected law is removed from the game. Once voting is finished, apply the laws and gain rewards. The final phase of a round is the reward phase. First, gain rewards from the counties in order (A-I). You can either take a nobleman from that county, or you can take the other shown reward. You can also pay 3 gold to take both. After the reward is collected, you get your knight back with squires heading back to the general supply. In castles, you get rewards for your knights, extensions, and company. Knights and extensions can be scored in any order. Company comes last, and you receive one voting marker for each nobleman at your table. Conflicts are resolved last. If England wins (the combined strength of the knights exceeds or equals the total on the conflict card), you get points based on how much you contributed to the fight. You remove the card and get your knights back. If France wins, you still get points, but significantly less. Your knights remain for the next round. If you lose a second time, your knights are captured, and you must pay one gold per strength level to get them back. If you don’t pay, they go back into the reserve. The conflict card is then discarded. After conflicts are resolved, two new conflict cards are put out and king’s favors are refreshed. Three new laws are revealed, and you start over with the placement phase. The game ends after the fifth round. After gaining bonus points (highest strength, most extensions, and noblemen). The player with the most points wins. So that’s Lancaster. I’m not sure exactly what to think of it yet. It doesn’t seem terribly difficult, but there’s definitely some strategy involved. As with most worker placement games, it seems that most of the game is about trying to figure out the best places to distribute your knights. Figuring out the most advantageous reward combinations will probably help a lot. It seems like it might move pretty quickly, but I’m sure some good AP can make it drag. One of the strangest things to me is the introduction of the Parliament phase right in the middle of the round. You’ve got this nice little worker placement thing going on, then you have to stop and do a little democratic process. The bonuses provided are probably really good for your strategy, so I’m sure you’ll have to be careful about helping others. It just seems a little out of place. Overall, I’m more interested in this game I probably wouldn’t have given a second look at without a nomination. I’m not sure how I’ll like it, especially since I’m a bigger fan of worker placement than I am of voting mechanics, but I’m definitely up for a game. Thoughts on its chances coming in the predictions, but I have one more nominee to talk about first. Thanks for reading!